Algeria’s soccer team competing in the World Cup in Brazil took the prize this year. No, not for winning the cup, although it’s true the Fennec Foxes got further along in the tournament than ever before. The prize the Foxes won was that of advancing the politics of the World Cup spectacle. The cup, like most international sports events in these days when capitalism in its imperialist stage dominates the world, is run to make profits, however popular soccer may be. And the World Cup is the most popular of all such competitions. FIFA (Fédération Internationale de Football Association), the soccer conglomerate running the games, establishes the rules to maximize these profits. In Brazil this meant using police power to displace the poorest inhabitants of favelas and spending billions to build stadiums that may be of dubious value beyond the games. The Fennec Foxes struck a blow that improved the atmosphere. 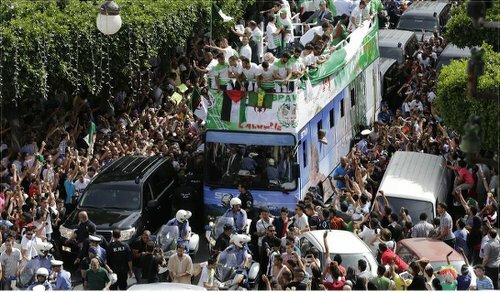 Not only did their team perform well on the field, making it to the round of 16, but they did something much better: They made a collective decision to donate their $9 million prize money to the people of Gaza. The donation comes as a welcome sign of solidarity with the people of Gaza, who have been facing relentless bombing from the Israeli settler state. It is also a sign that someone can be a star without losing his/her political conscience.